Cine_Real: an ongoing series exploring the impact of new media on the form and process of filmmaking and its exhibition. The two works, "Bx3M: a work in process" and "Idolatries/Idolatrías", utilize digital technologies towards very different ends, however, both alter our understanding and appreciation of cinema. Bx3M: a work-in-process displays the raw editing process in real-time, from shot selection to montage to scene-building. Once hidden from view, this end stage in the making of a film becomes a performative act that alters our film sense. For filmmaker and curator Judith Escalona "Bx3M is a feature shot digitally, which affected the production process in many ways, allowing for more takes and greater experimentation within the scope of the storylines of the three main characters. Editing Bx3M also involves a rethinking of form and how process affects it. The length of scenes, the quick rendering, and, generally, the more improvisational nature digital media affords, makes audience participation, when desired, possible." Visitors to the gallery can watch the screen passively or actively participate in the editing process. Idolatries/Idolatrías serves up the canned produce with the pretty Latinas on the labels you might find in your local bodega. Scanning the barcodes on the labels reveals the classic stereotypes of women from Latin American cinema, correlated and pre-digested. 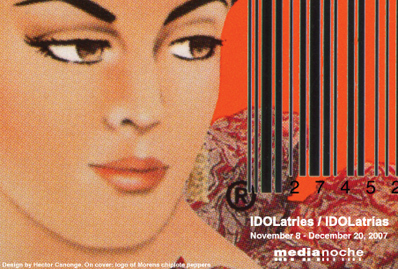 According to new media artist Hector Canonge: "While shopping in my local supermarket, I noticed the images of seductive, virginal, maternal and mythical female figures on the labels of cans, bottles, and boxed products commonly used in cooking and consumed by people from different Latin American and Caribbean countries. This phenomenon intrigued me, so I started to explore possible ways to integrate the colorful objects in my work. Each of the sixteen products in the installation correspond to a movie clip. Visitors use the hand-held commercial barcode scanner to scan a product label. Connections emerge between product, image, visual narrative, and symbolic meaning." JUDITH ESCALONA, Filmmaker and Curator of Cine_Real. She is the writer and director of Bx3M, the story of three Latino youths coming of age in a city going up in flames. The Krutch, which she also wrote and directed, has been presented in several film festivals, including The Havana Film Festival; Loisaida Cortos; Harlemwood Film Festival, NY and Tokyo; and Transvoyeur, Liverpool and Cologne. Judy is the Executive Director and Co-founder of Puerto Rico and the American Dream (www.PRdream.com), an award-winning, bilingual, cultural web site, and MediaNoche (www.medianoche.us), a new media art gallery and digital film studio. She is the creator of MediaNoche_WiFi, extending the MediaNoche gallery outdoors and offering the community free, wireless internet access; and organizer of the yearly Handball Court Summer Film Festival. Judy recently served as a consultant to the government of Bermuda for its IPTV station, helping them develop their programming and finalize the equipment for the television station. She is also a film curator and critic who has written for various publications, including the Daily News, NY Latino, QBR/Quarterly Black Review, and Womensnet.net. HECTOR CANONGE is an independent film-video-new media artist who lives in New York City where he studied Literature, Film and Interactive Media Technologies. He's been nominated for a 2006 Rockefeller Fellowship in New Media and is the recipient of Harvestworks 2006 Scholarship. In 2005, he organized urbanInterfaces v.1, a media event which explored the use of open source technologies and interactive collaborative narratives. He also presented SonicBytes, a Psychogeographic Collaborative Project where he directed young designers to explore and discover their immediate surroundings while recording city sounds. His Web-based, interactive, open source wireless project, CIUDAD TRANSMOBIL was featured at the Queens Museum of Art Biennial, Queens International 2004. He was a guest speaker in the CUNY 2004 Media Conference: Journalism, Media and the Big City, and participant of Documentary Intentions in the Age of New Media organized by SUNY, Buffalo, and CUNY, Hunter College (2003). He worked in the launching, and is presently in the steering committee of New York 2050, a project involving the people of New York to help envision the future of the city.